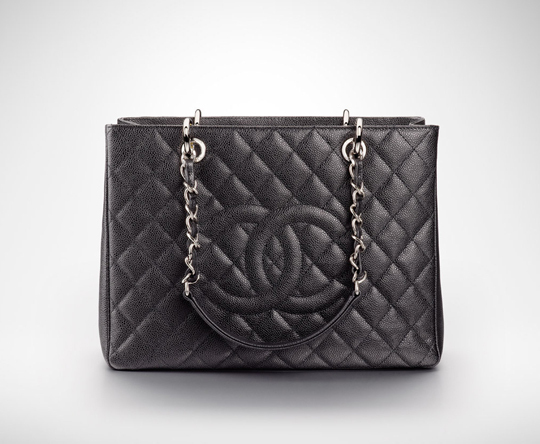 The Grand Shopping Tote, also known as the GST, may not be worthy of the term iconic but it is certainly considered one of Chanel's classics. With a practical design and more affordably priced than the 2.55 quilted flaps, GSTs are indeed a must-own piece for any Chanel-lover. Sadly, as of this year, I've been told that the French fashion house will stop producing GSTs. Though the news is heartbreaking, if you've always dreamed of owning this bag, it may not be too late as several boutiques in the city currently carry them. When I checked on the inventory this past weekend, the Chanel flagship, SoHo boutique, and Bergdorf each had one black GST with silver hardware. As for other locations, the Madison Chanel had one black with gold hardware and Saks had one extra large black. Bloomingdale's and Short Hills Mall in New Jersey had no inventory. With the Céline Edge bag also soon to be discontinued, it looks like two grand farewells are in order for 2015. I was thinking to get this bag later this year. Should i buy or not buy it id i wanted this bag to be an investment?? Does discontinued means it loses its 'status'? you should buy it! it will gain status bc you cant get it anymore!